Tender Chicken breasts are seasoned with our smoky chipotle balsamic and Mission Fig Spread to give these gilled sandwiches a spicy Southwestern flair. Marinate each chicken breast 4-6 mins in the Apricot Chipotle Balsamic. Cook the chicken on the press until chicken is firm and nicely grillmarked on both sides. Brush bread with Basil Oil, flip and spread mayo on other side. Add a layer of Mission Fig Spread on the bread. Top with cheese, chicken and avocado dividing evenly. Top with bread slice with a nice layer of Mission Fig Spread. 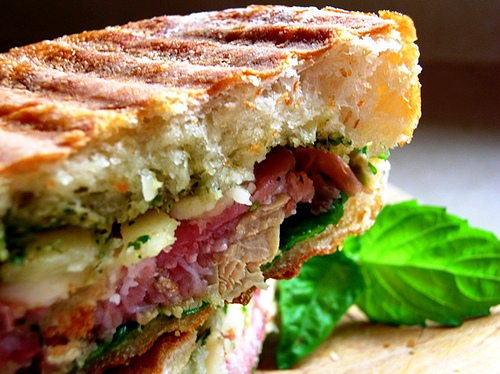 Place two sandwiches on panini press, close lid and cook until cheese is melted, 3-4 ins. Repeat with each sandwich. Cut in half and serve. Ahhhh! Heaven.